If you are searching for an all natural alternative to store bought antiperspirants and deodorants, a Himalayan salt deodorant bar is a perfect solution. 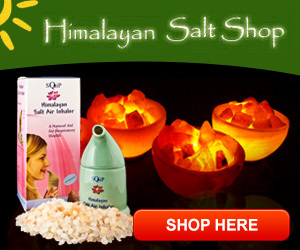 Himalayan salt used as deodorant kills odor causing bacteria without any chemicals or additives. Deodorants bought in the commercial marketplaces contain Aluminum which is a metal. It actually blocks your pores and stops flow of sweat to the skin’s surface. Does that even sound healthy? Many of these store bought deodorants also contain Parabens. Many scientists believe both of these ingredients to be linked to breast cancer though this is not yet proven. Several years ago I developed this cyst under my arm that had to be surgically removed. It was very painful prior to removal. It turned out to be an infected sweat gland. After surgery, my doctor suggested I use no roll on antiperspirants and to switch to a spray on and use it sparingly. He said my best bet was no deodorant of any kind what so ever. In hind sight I wish I had known about these Himalayan Deodorant stones. Had I used them instead, I may never have developed that painful underarm cyst in the first place. One of the most popular Himalayan Salt Deodorant Bars is here. These salt bars are not processed and come straight from the mines. They are simply cut, carved, shaped and smoothed. You simply wet it and gently rub or pat under your arms. You can also apply it dry to already damp underarms, such as immediately after showering before you dry off. Some salt bars are rougher in texture than others, so patting it will work fine. If too course or rough, it could cause tiny scratches in skin. Also if your skin is sensitive after shaving, you may want to wait a while before applying as it can burn for a bit on freshly shaved skin. These himalayan salt stones or bars when combined with moisture leave an invisible film on your body that helps kill odor causing bacteria through out the day. Many use a Himalayan salt deodorant bar for their feet as well. This is a simple and healthy solution to foot odor and can help with the treatment of athletes foot for obvious reasons. After use of the Himalayan Salt stone simply dry it off and keep it in a dry place. Storage in a shower is not suggested though it can be used in the shower. Always store it in a less humid environment to prevent crystallization. Very interesting, I’m always curious to try natural alternatives to commercial, toxic deodorant, especially since I have learned that the aluminum they contained might be linked to alzheimer! I guess I’d want to try these in a controlled setting, to make sure they work for me. My husband uses one of these Himalayan deodorant bars! I keep hearing how dangerous our regular deodorant is for us. They’ve linked the ingredients in it to Alzheimer’s Disease and lots of other major health issues. We’re not supposed to be clogging our pores with nasty chemicals and harsh ingredients. I love all-natural solutions. This is one of those things that you have to “try it yourself” to really know if it works for you. We all have different PH balances, finding the right all-natural deodorant is hard for some people. I used to be really stinky, no joke, but now that I eat cleaner foods, not so much. I’ll have to give this pink salt bar a try and let you know if it curbed by stink appeal.